FREE Pelvic Health 101 Classes at Beyond Basics Physical Therapy: Come Learn With Us! It’s that time of year again, the leaves are thinking about changing colors, kids are sporting brand new book bags and returning to school, and we at Beyond Basics Physical Therapy are gearing up and getting ready to start up our hugely successful Pelvic Health 101(PH101) classes for the fall, as well! We couldn’t be more excited! This Pelvic Health 101 Course is the third in our series of PH101 courses. Our courses will cover a variety of topics from male and female sexuality, bowel and bladder health, nutrition, as well as complimentary medicine for pelvic floor dysfunction. In this blog we will sit down with one of Beyond Basics’ Physical Therapists, and the creative force behind our Pelvic Health 101 Classes, Stephanie Stamas, to get more information on this wonderful resource. FM: Why did you begin PH101? SS: I began the Pelvic Health 101 seminar series last fall out of a desire to help educate more people. There are a lot of people out there who have consistently been told there is nothing wrong with them, it is all in their head or they should just get over it. I wanted to put together an educational series that would validate people’s suffering as well as give them tools to heal and return to a normal life. I believe that information is power, and that power gives people freedom and hope – two things that are often lacking in patients suffering with pelvic floor dysfunction. Our schedule of Pelvic Health 101 classes! FM: Who is the intended audience for PH101? SS: Current patients, prospective patients, healthcare providers who have questions about how to better treat pelvic pain, bladder and/or bowel conditions – really anyone. I tailor these classes so they are understandable to the general population, but I also try to give more in-depth information than one might not find elsewhere. I really want class participants to leave with a clear picture of what is going on with their bodies. FM: Do you have to be a current patient at BBPT to go? SS: Not at all! Most of the participants have been prospective patients looking for more information and seeing if physical therapy can be helpful for their condition. We’ve also had plenty of other healthcare providers come to learn more about the musculoskeletal component to bowel, bladder and sexual dysfunction. Everyone is welcome! FM: What is your favorite topic to cover? SS: I really love them all, but especially the bowel lecture, “Why is Pooping so Difficult”. It’s fun to be an adult and get to talk about pooping! Potty talk is often not socially acceptable but I like to open the floor to talk about issues that are often swept under the rug. I also really love our Ladies Only Night. It’s a safe place where women can come and ask any of their questions concerning pelvic health in a friendly, fun, women only environment. It almost has the feel of a girls’ night in with your friends, minus the pajamas and pillow fights. FM: What are some of your favorite reactions from last years’ class? SS: I love seeing “light bulbs” click on when people discover anatomical and physiological reasons why they are experiencing symptoms. People get so much bad information along the way and often times are told everything is in their head. I love the smiles and hope on people’s faces when they hear the good news that it is not, and that there is a solution to their symptoms! FM: What’s different/ new and exciting this year? SS: This year we have assembled an expert panel of pelvic pain specialists to do a question and answer forum with the class participants. The experts on the panel will be Gynecologist Dr. Dena Harris, Urologist Dr. David Kaufman and Physiatrist Dr. Allyson A. Shirkhande. 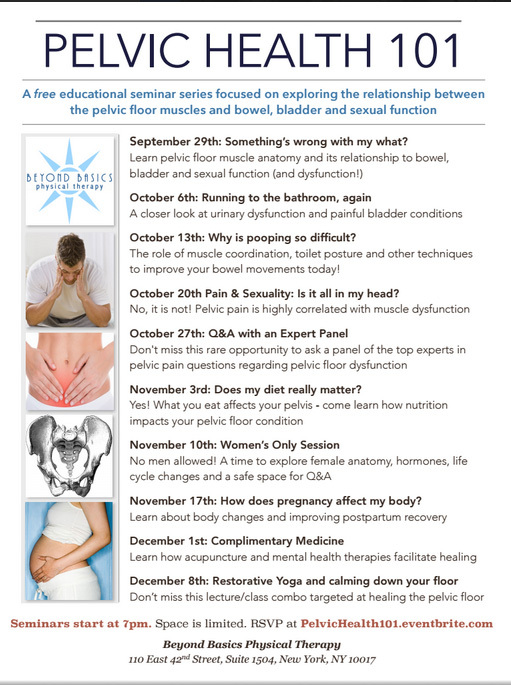 This is something I have wanted to organize since starting the pelvic health series so I am really excited to provide this unique and valuable opportunity to patients, especially those with complex cases. We will also be video recording some of the lectures so they can be available online for those outside of NYC. We have had a lot of requests from all over the world to have access to the lectures. We are passionate about education and providing good information, so we are excited to record them and make them available online. FM: What should people do who are interested in taking the class? SS: They should sign up online as soon as they can at PelvicHealth101.eventbrite.com. The classes are free but space is limited so they do fill up quickly. Light refreshments will be provided. Check out our class schedule below! Blue Pills for Guys and Pink Pills for Gals: Is Female Viagra is Here? How can we access the 101 classes on line? Thank you in advance for doing this for all of us suffering with pelvic pain. You’re the best!! Unfortunately the classes are not available online, but if you are in the NYC area you can sign up via eventbrite at pelvichealth101.eventbrite.com. We are currently working an option to provide this resource to our out of town folks. Stay tuned to the blog for more discussion of pelvic pain topics.